In this SmartCart series, you learned the basics of SmartCart, how to customize your cart with columns, and how to modify carts and products. Now we approach the final installment, where you will learn how to integrate Midwest Tape’s Workflow Solutions into your shopping experience. How do I input instructions for individual titles? Follow the directions below to add notes to your order. These notes are only for your benefit. They will show up on your invoice, but they will not affect processing done by Midwest Tape. 1.) 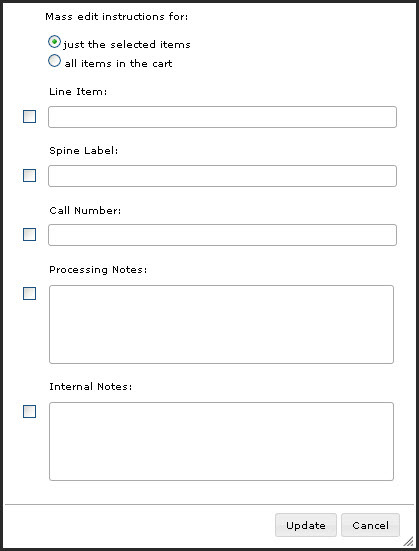 Under the Instructions tab, you can specify details for line item, spine label, call number, processing notes, and internal notes. These notes apply to individual titles. 2.) You can also adjust Quantities, Branch Distributions, and fund amounts under the Quantity tab. 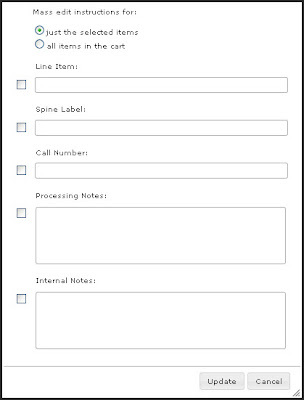 Note: If you wish to sign up for our customized processing service, fill out our workflow solutions brochure or call 800.875.2785 to speak to a customer service representative. What if I need to add the same information for a group of titles? With Midwest Tape’s SmartCart you can add instructions for multiple titles with Mass Edit Instructions. 1.) Check the corresponding box to the left of the title. 2.) 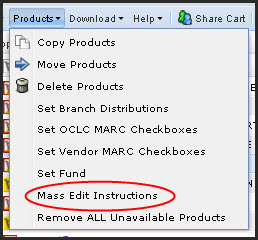 Select Mass Edit Instructions from the Products dropdown menu. 3.) Check the fields you wish to edit and fill in the instructions. These new instructions will overwrite existing instructions. 4.) Click the radio button “all items in the cart” or “all just the selected items” and then update to change the instructions. 5.) From the Products menu, you can also Set Funds as well as Set Branch Distributions for multiple items. How do I download cataloging records? SmartCart allows you to download Vendor Records (free) and MARC on the Spot Records ($1.20/title) directly from our site. 1.) Click Download in the command toolbar. 2.) Select between Vendor and MARC on the Spot records. 3.) If you are not set-up to download MARC Records, you will be prompted to fill out a Full OCLC Acceptance Form. 4.) 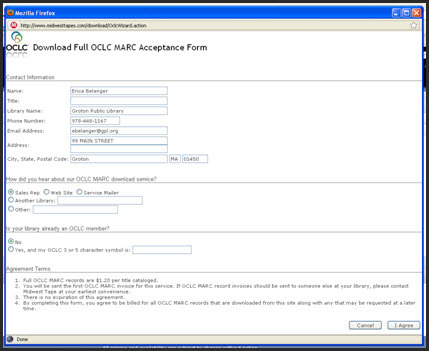 Check out our additional guides on how to download MARC on the Spot and Vendor MARC Records. This concludes our SmartCart blog series, but be sure to look for our upcoming SmartCart video tutorial. In the meantime, play around with SmartCart and share your thoughts and experiences here as comments.